Ah, when research for a news post meets procrastination. I've made sure that the details for this one are spot on, by which I mean I've just watched half an hour of people playing Left 4 Dead 2 very fast and I'm trying to pass it off as work. That's right: Awesome Games Done Quick is back for 2016! Awesome Games Done Quick is an annual week-long streaming marathon by speedrunners raising money for the Prevent Cancer Foundation. 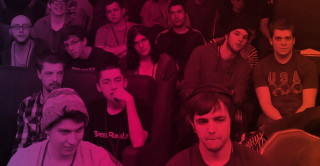 Last year they pulled in $1.5 million from donations, merchandise and an AGDQ Humble Bundle. This year's adventure eased us in with a half-day's speedrunning on January 3, and runs solidly through to the finale at 5:47 AM Sunday, January 10. Today's PC gaming highlights include the aforementioned time-sink, Left 4 Dead 2, Devil May Cry 3 or 4, Darksiders 2 and the latest Resident Evil remaster, but if you miss anything it's preserved for posterity on the Games Done Quick YouTube channel. The full schedule can be found here.